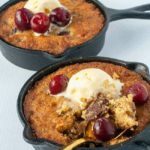 This gluten-free Cherry Chocolate Skillet Cookie has crispy edges, soft, melted chocolate chunks and sweet cherries in every bite! 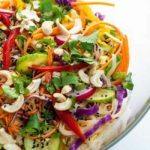 Paleo and keto options. 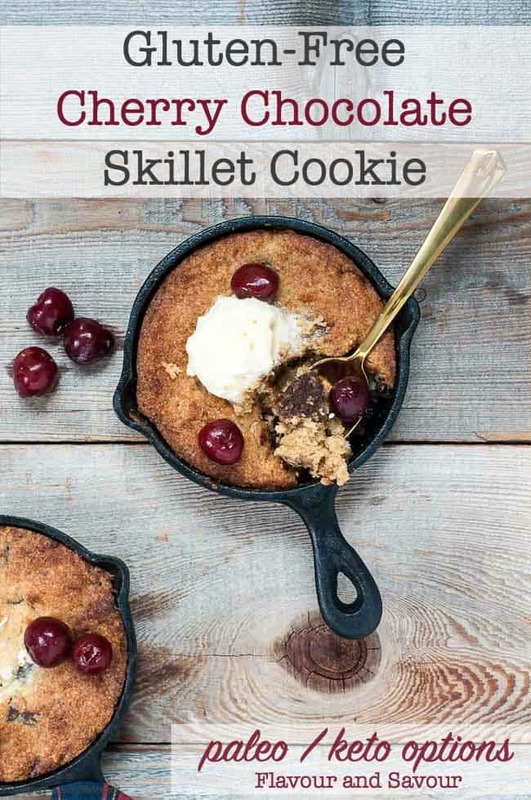 Gluten-free Cherry Chocolate Skillet Cookie to the rescue when you need a quick dessert! 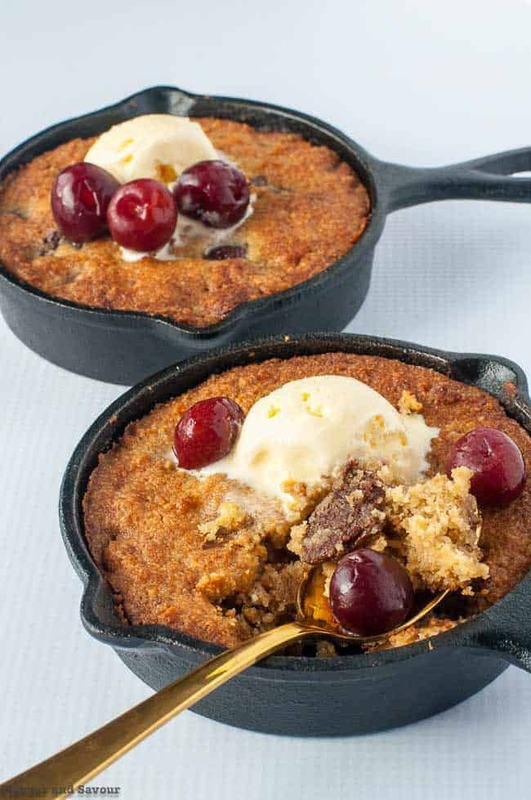 Pop this in the oven, grab two spoons and dive in to this skillet cookie with your partner. Gooey chocolate, sweet cherries and a soft cookie with crispy edges: who knew eating a cookie could be this much fun? I’ve included options to make this cookie work for your diet, whether that’s gluten-free, paleo or keto. It’s easy to adapt and is just as delicious whichever way you choose to bake it. For Paleo diet: choose coconut oil and coconut sugar, use dairy-free chocolate. For Keto diet: choose butter or coconut oil, 0-calorie sweetener, and dark chocolate sweetened with Stevia. Cherries have a slightly higher glycemic index than berries, so you can substitute raspberries for the cherries if you like. 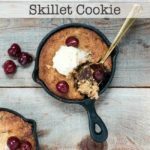 An Easy Chocolate Skillet Cookie recipe! Beat the wet ingredients, whisk the dry ingredients, combine the two, then gently fold in the cherries and chocolate. Bake until a toothpick inserted in the centre comes our clean. Let it cool for a few minutes, top with ice cream, whipped cream or whipped coconut milk and dig in! 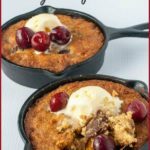 If you love gluten-free desserts with cherries, try these too! 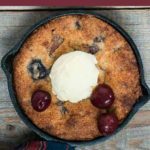 This gluten-free Cherry Chocolate Skillet Cookie has crispy edges, soft, melted chocolate chunks and sweet cherries in every bite! 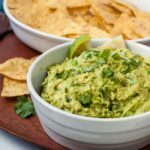 Easy to make it paleo, keto, or sugar-free. Heat oven to 350° F. Grease two 5-inch mini cast iron skillet with coconut oil or butter. Beat the butter (or coconut oil) and erythritol (or coconut sugar) until smooth. Add egg and vanilla and beat until well combined. Whisk the almond flour, baking soda and salt and add to the wet ingredients, mixing well. Gently fold in the cherries and chocolate chunks. Divide the cookie dough between the skillets and press right to the edges until smooth on top. Bake for 20 - 22 minutes or until nicely browned and toothpick inserted in centre comes out clean. Remove from oven. Cool in pan for 10-15 minutes, then serve plain, or with ice cream, whipped cream or whipped coconut milk and a few extra cherries. I used a dark chocolate sweetened with stevia to keep this sugar-free. This looks absolutely delicious. Have saved it for when Tom gets home. Where do you buy your chocolate sweetened with stevia? The brand I’ve found is Cavalier. It comes in all different flavours, like chocolate with berries or with praline. I get it at Great Greens Market, but you can probably find it at any health food store. Tom would probably love this! Elaine, this looks delicious! My partner loves cherries and chocolate. I should make this for him! Thanks Donna! 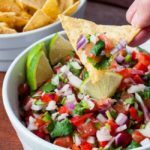 It’s hard not to love this one–quick and easy! Delightful! Love the chocolate & cherry combination – such a perfect treat for Valentine’s Day too! Thanks Jessica! Happy Valentine’s Day to you and yours! 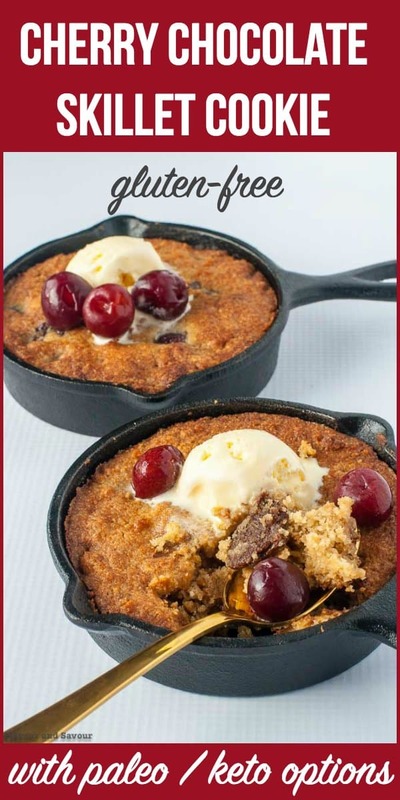 I just LOVE dessertsin a skillet! The presentation is always so fun! 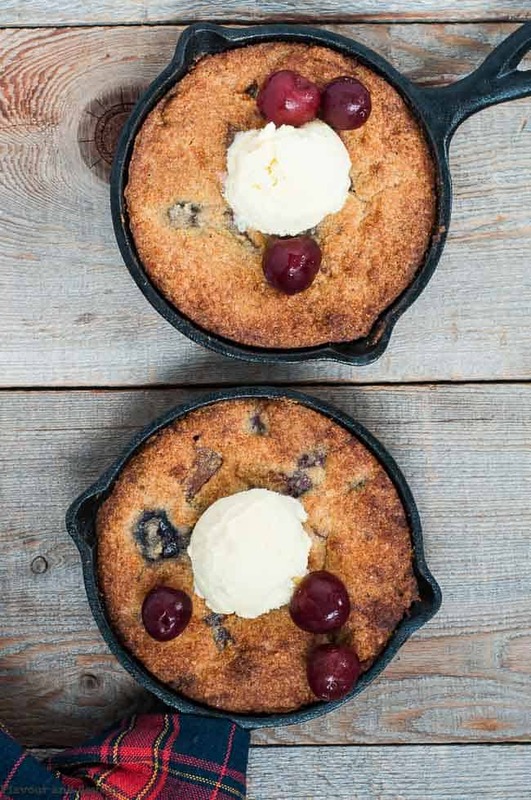 Hubby and I will celebrate Valentine’s Day the weekend after (Valentine’s Day is our fur baby’s birthday) and this skillet cookie would be absolutely perfect (maybe with a glass of vino). Pinned! Oh my goodness, this looks sooooo good! I need to find some little skillets to make this recipe! Thanks Lisa! They’re lots of fun to use and readily available on Amazon. Happy Valentine’s Day! Why a totally fun and whimsical dessert, Elaine with the best of both of favourite textures! I love it ❤️🍫. And even better that it is shareable. Thank you for all of the dietary versions, too – so thoughtful! I will be making this delightful dessert soon. Thanks Denise! 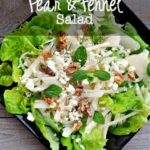 With gluten-free me and sugar-free Denis, I’ve been experimenting and finding lots of fun things to make that we can both eat! Happy Valentine’s Day! Can’t go wrong with chocolate and cherries, and a great treat for Valentine’s Day or the weekends. Thanks Philip! Agreed–that’s a favourite flavour combo of mine. I’ve been dreaming of these ever since I saw them on Instagram. I even have these little skillets, so I think Valentines Dessert is solved. Pinned, thank you! Thanks Colleen! Yes, those little skillets are fun to use, not only for desserts! They’re great for mini breakfast recipes, too. 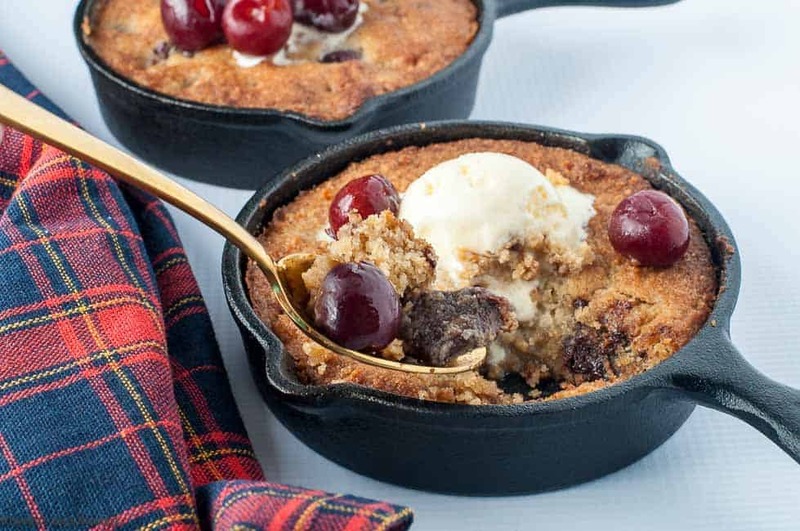 I have everything I need to make this skillet cookie, right down to the frozen cherries! Definitely my kind of dessert Elaine! Love cherries and chocolate together! Leanne, once I discovered that frozen cherries were so incredibly good, they have become a staple in our home! Happy Valentine’s Day! This looks so delicious! (I might not want to share! 😉 ) Chocolate and cherries are one of my favourite combinations! Thanks Kim! I love that combo too.